A pair of Chinese jade gilt silver wirework earrings from the 1920s-30s. 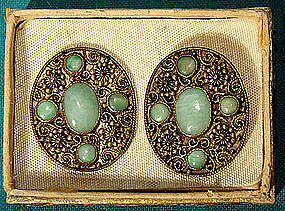 They have genuine Chinese jade cabochon stones and these 1" x 13/16" jadite or jadeite screw-back earrings are stamped STERLING on the closures, they have gilding over the fine silver wirework and they are in the original silk lined and trimmed box bottom (top missing, some damage to box). The top of the earrings are low grade silver, and the earring screw backs are sterling. They weigh 7.7 grams and they are in excellent original condition with no chips, cracks, dents, bends, corrosion, losses, damage or repairs. All items are thoroughly and conservatively graded and all condition issues are noted; all items are vintage or antique and may have slight signs of gentle use. Expedited tracked and insured parcel shipping to the U.S. starts at $19 (other spots may vary, air is higher). Items paid with a credit card will be shipped to confirmed addresses only. We do ship internationally. All of our prices are in $US. PLEASE NOTE: We DO NOT accept PayPal. A fine quality Chinese carved and coloured bone scrimshaw brooch in an ornate filigree gilt silver setting c1920s-30s. This 1-1/2" x 1-1/4" pin has a safety catch and it is marked MADE IN CHINA SILVER; the scene is of flying birds with flowers and branches. 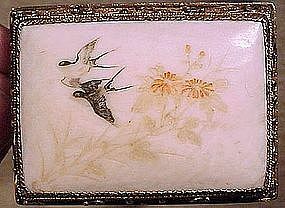 The black and orange of the flowers is mostly intact however the green of the leaves and branches has faded, and this item is in good original condition with no chips, cracks, scrapes, dents, monograms, bends, corrosion, damage or repairs other than the fading of the green colour and a tiny crack in one extreme corner. Small packet shipping to the U.S. starts at $9.50 (other spots may vary). Items paid with a credit card will be shipped to confirmed addresses only. We do ship internationally. All of our prices are in $US. PLEASE NOTE: We DO NOT ACCEPT PayPal, only VISA or MASTERCARD. 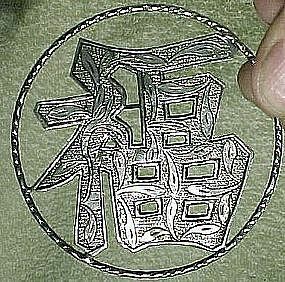 A large Chinese export silver Good Fortune brooch circa 1900. This pin measures 2-1/2" across; it has a c-clasp and it is unmarked (but has been tested as high grade silver). 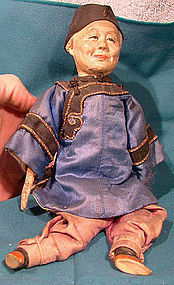 This item is in excellent antique condition with no scrapes, dents, monograms, bends, corrosion, losses, damage or repairs. All items are thoroughly and conservatively graded and all condition issues are noted; all items are vintage or antique and may have slight signs of gentle use. Expedited tracked and insured parcel shipping to the U.S. starts at $18 (other spots may vary, air is higher). Items paid with a credit card will be shipped to confirmed addresses only. We do ship internationally. All of our prices are in $US. PLEASE NOTE: We DO NOT accept PayPal.